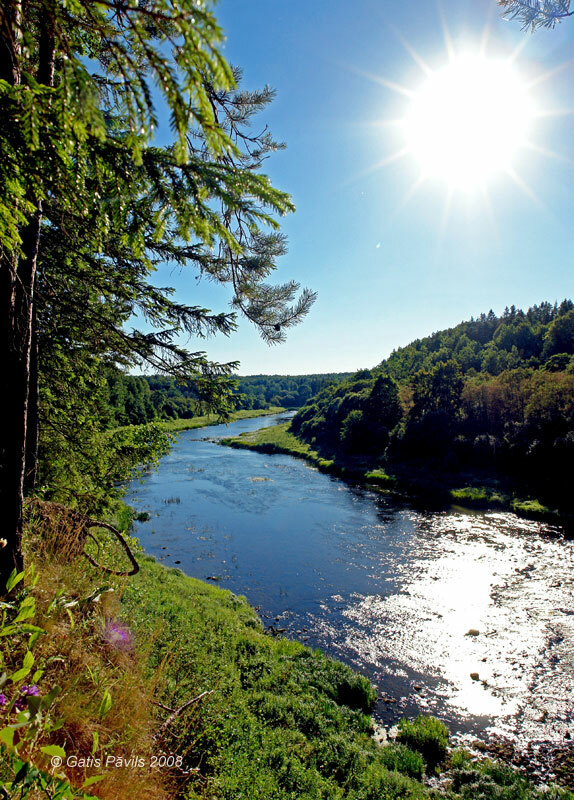 Conservation status: Geological and geomorphological natural monument of state importance Nr. 97. One of the most picturesque cliffs in Courland is Gobdzinas cliffs. 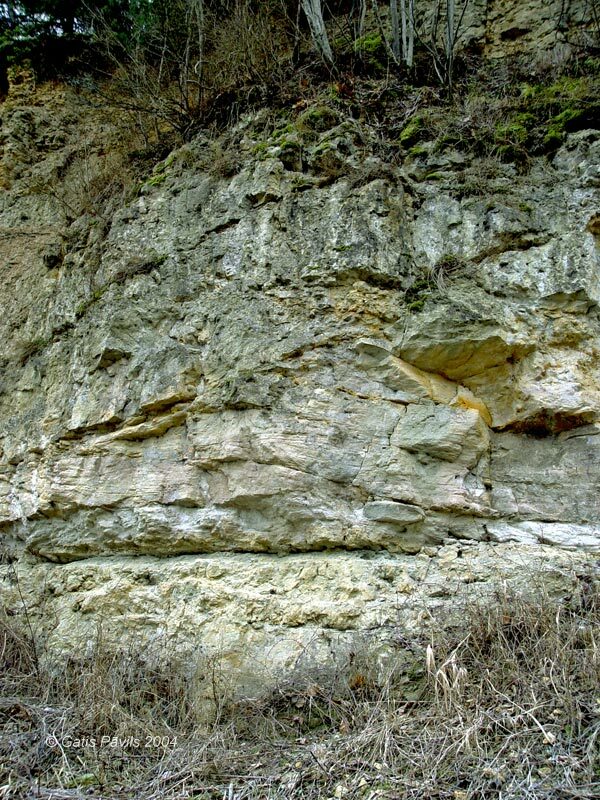 Here at the bank of Venta there are exposed deposits of Upper Devonian time - approximately 400 metres wide and up to 11 metres high sandstone and dolomitic sandstone cliffs, in the upper part of cliff - also dolomite. 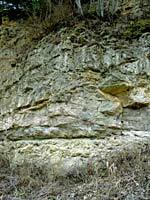 As a result of survey of this and nearby cliffs there has been identified a specific minor stratigraphic unit - Gobdzinas member. 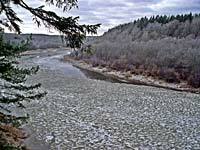 There is leading a trail both at the foot and upper side of the cliff - there are wonderful sights from both trails. It is possible to ford Venta here. At the foot of the cliff there is located Gobdzinas cave. 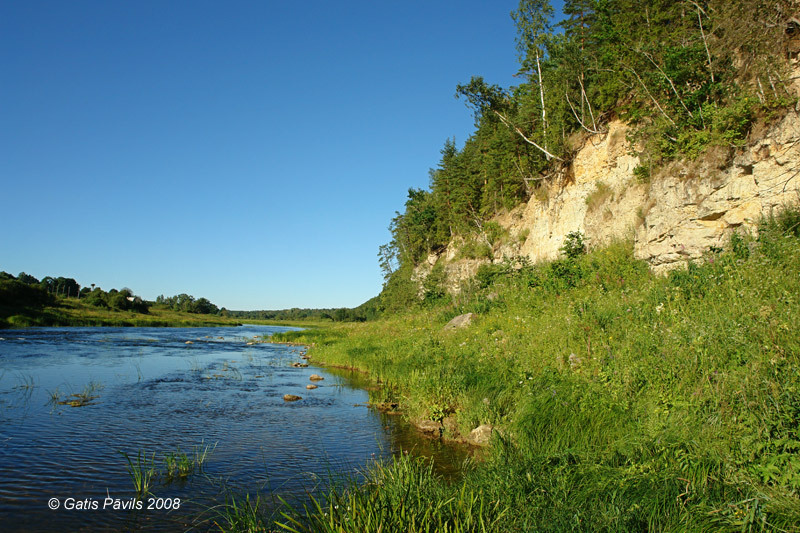 Sandstones of the Gobdzinas Member have formed in shallow sea with active water currents. 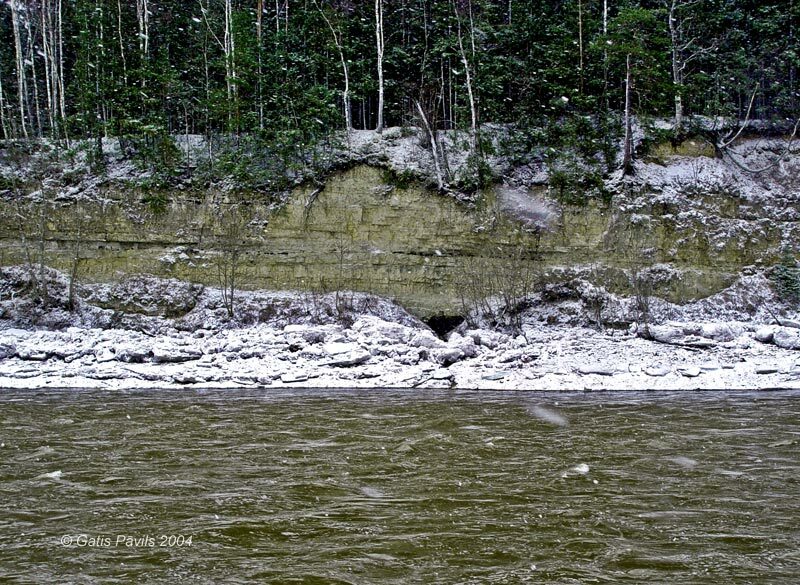 Today the directions of these ancient currents can be measured by peculiar geological signs left in sandstone – cross-stratification. It is a kind of layering, where small layers are inclined to one direction. This direction shows the course of ancient currents. 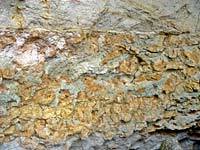 Later, due to activity of groundwater, sandstone has been partly cemented by dolomite and chert. The dolomite of the Nikrace Member is very interesting from geological point of view because it has formed in ancient desert environment. 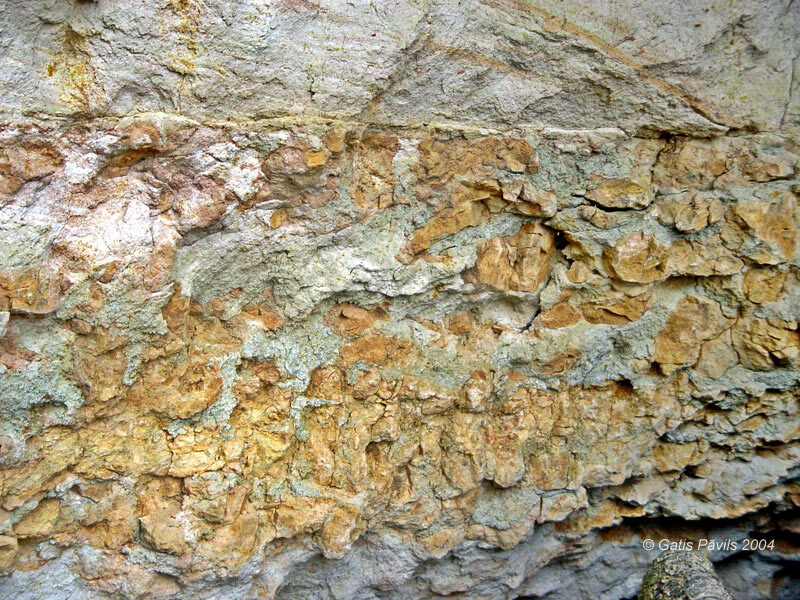 Dolomite has irregular structure, many cavities filled with clay and many other features show that it is an ancient hard crust which formed when the Devonian sea retreated from the present area of Latvia. 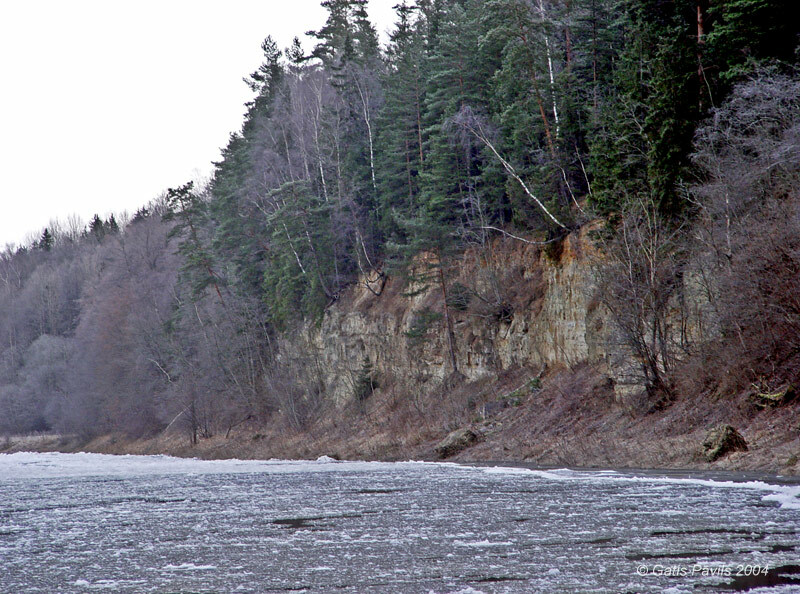 Gobdzinas cliffs from the opposite bank of Venta river, entrance in the cave is visible. 2004.02.09. 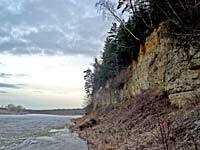 Gobdzinas cliffs, layer in close-up. 2004.02.09. View from Gobdzinas cliffs in winter, drift-ice in Venta. 2004.02.09. 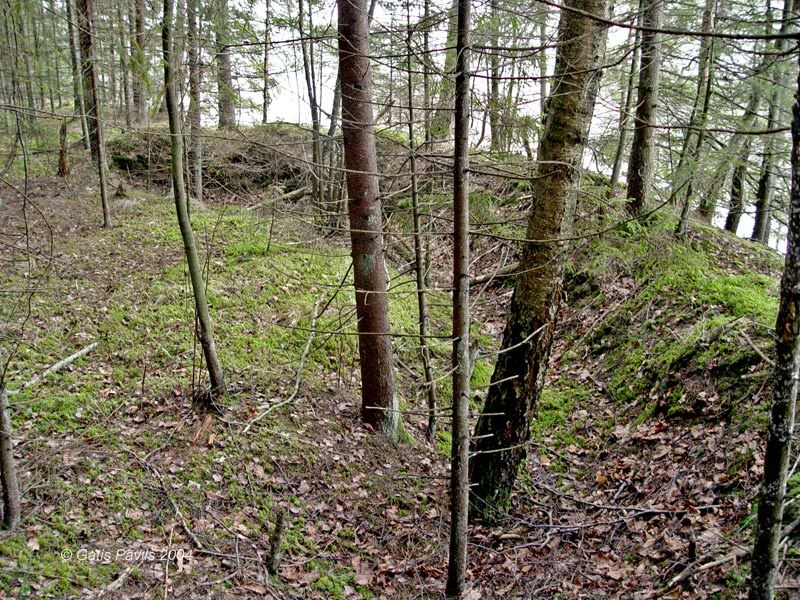 War time entrenchment in the upper edge of Gobdzinas cliffs. 2004.01.04. 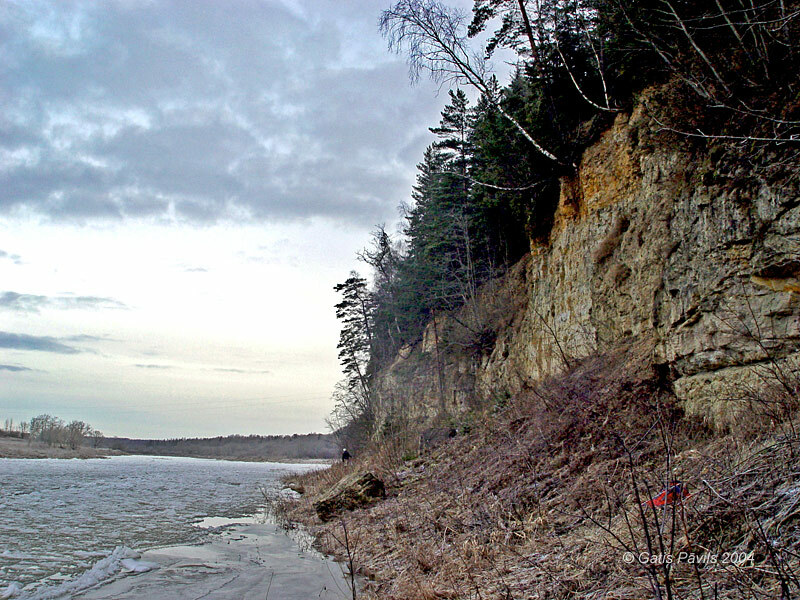 Layers exposed in Gobdzinas cliffs. 2004.01.04. View from Gobdzinas cliffs. 2008.07.26. 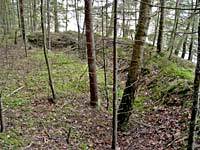 Sincere thanks to Girts Stinkulis (University of Latvia, Professor in Department of Geology) for amendments in this page!